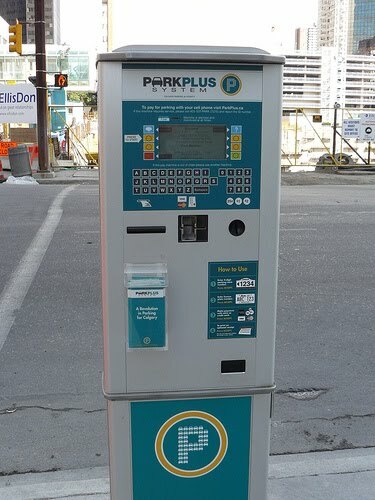 I have a history of conflict with the Calgary ParkPlus system. The first time I used one of the new machines that don't take coins, only credit cards, I ended up paying $27.00 to park for less than 10 minutes. Then I tried to use one of the machines in an unlit parking lot at night and discovered that the screen is not backlit. That time I ended up only paying for 2 hours of parking when I really needed 4, because I had no idea what buttons I was pressing. But that time I got away with it. The way the ParkPlus system is set up for on-street parking, the streets are divided up into numbered zones, each zone depicted by a different 4 digit number. There is a ParkPlus machine somewhere in the vicinity that services several of these zones. This is trickier than it sounds, when you are trying to decipher the various options on the machine and there is a line forming behind you, everyone waiting to pay their money before the Parking Authority guy drives by taking photos of all the license plates. A few weeks ago I was in Kensington fumbling with the ParkPlus when I blanked on my license plate number. I couldn't see the urban assault vehicle from the machine, I had already swiped my credit card, and there was a guy standing behind me rattling his keys. So with panic rising, I took a wild stab at the number. Three days later I got a parking ticket in the mail. After questioning the parentage of the entire municipal government, I remembered that I had taken the optional receipt from the ParkPlus machine that afternoon, so I rummaged through my purse and uncovered the wrinkled but legible parking receipt from underneath a fistful of shopping lists. There, it clearly indicated that I had 8 minutes still left on the machine at the time the photo of my license plate was taken. It also showed a license plate number that was not mine. It was kind of close to mine, and it was the sort of number that someone in a panic to remember their number might come up with, but it was definitely different from the plate on my car. This sort of thing must happen ALL THE TIME because when I called the city, I was quickly told exactly what information to fax in to have the ticket reviewed. When I sent in the information I admitted that there was a discrepancy between the license plate number on the receipt and my actual license plate number. While I refrained from calling the ParkPlus system a stinking whore, I did use the opportunity to point out the inadequacy of the system by rather unnecessarily adding "I suspect my confusion was brought about by the pressure of having a line of people behind me waiting to use the machine". Yeah, they cancelled it. Seems like a tremendous waste of time and resources for a situation that would never have arisen with a parking meter, or even with a machine that spits out a receipt that you put on your dashboard. I'm thinking of getting my license plate number tattooed on my arm for next time. Stick it to the man girl! The man has been stuck, Dr M! Barb, if you were running City Hall, this kind of nonsense would never happen! Keeping old receipts must be a Bruederlin trait...it has served me well many times. That can only be you, Berni. You never know when you are going to need to return something, right? "This is trickier than it sounds"
Ouch. It sounded pretty tricky already! Sorry, forgot to identify myself! Yes, as you know, I feel I must be The Queen Of Returns. It's because of a character flaw...indecision. And my odd size. And my cheapness gene. I've never been at one of those machines where it requires you to put in your license plate number, but have been at ones that require all the rest. I have only know 3 letters of mine, so it's for the best I have not crossed paths with such robots yet. you could get a personalized plate that would be easy to remember? It was beyond my capability, John. I think it's a ploy to increase use of public transit. You truly are the Return Queen, Berni. do you often find the stores are inexplicably locked when you approach? I am advising that you don't park anywhere in downtown Calgary, Al. It's like being on Jeopardy. I know my license plate number right now, but not when the pressure is on to perform. That would be an excellent idea, Kelly, were it not for the fact that I hate personalised license plate number even more than I hate the ParkPlus system. I didn't like it when they changed the one in Montreal, from parking meter to paying to a machine (but your parking spot is clearly identified by a post with a letter or two, and 3 numbers). But we can still pay with coins and now with cards, and we don't have to write the license plate (and by the way the screen is backlit)... the thing I don't like here is trying to understands the signs that tell you were and when you are allowed to park and if a parking sticker is required or not... but now, thinking about it, I don't hate the Montreal system as much as I used to! There are some areas here as well for which you need a resident sticker to park on the street, Evelyne. I suspect that most big cities have them now. I too have no idea where those areas are. I don't normally need to use the receipt, Kathy, as I hardly ever buy things and return things even less, but sometimes they can save you $40. 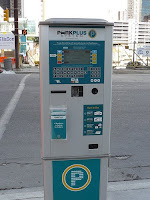 I have used this so-called "Calgary" parking system when my brother and I attempted to purchase cupcakes at Crave. We kind of walked around lost and clueless and then started yelling about what zone we were in.